This exercise is intended to increase range of motion at the shoulder joint and find movement across diagonal fascial lines between the shoulder blades. To do this exercise you will need a mat. Start by lying on your back with your knees bent, your feet planted in the floor, and the tips of your fingers touching your shoulders. Point one elbow at the ceiling and one elbow at the ground, and then begin circling the elbows in opposite directions. Repeat 6-8 times and the switch the direction of each elbow. 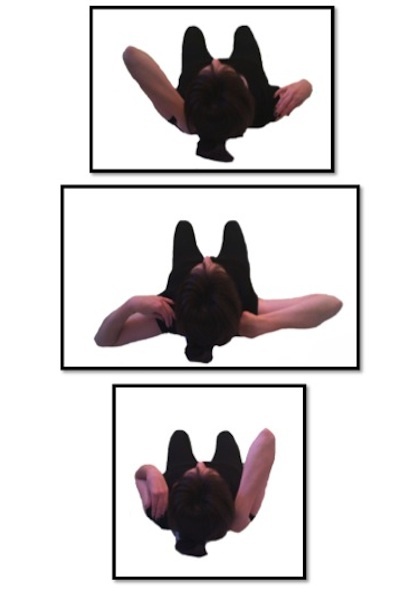 This exercise can begin the process of correcting imbalance between shoulders. Notice the relationship between the shoulder blades as you do this. It is rare for our arms to be moving symmetrically and this exercise can help introduce efficient functional movement in the shoulder blades.